I’ve not been out for a few weeks on the bike and I’ve not posted on here for a while either, so i’ll kill two birds with 1 stone. Having been riding up Rooley Moor on my own and in the dark, i’ve been getting some ear ache from home – What if you fall off, what if you break something, etc. 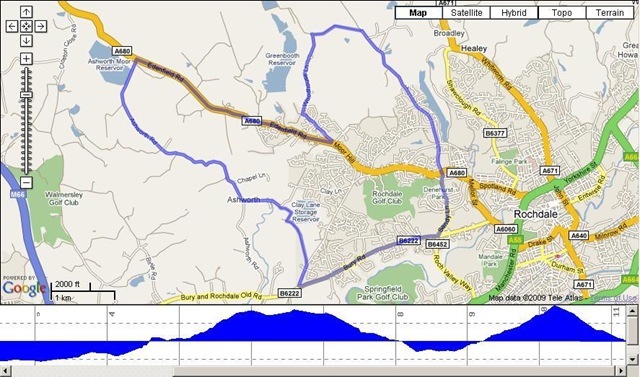 To get round this i’ve plotted a route that goes over towards Ashworth Valley. I’d say 90% of it will be on road, apart from Jowkin Lane and the top of Woodhouse lane it’ll be road work. I want to see how quickly I can go on smooth tarmac, albeit with big knobbly tyres. I’m hoping the climb up Ashworth Valley Road will be easier than the cobbles/gravel of Rooley Moor so I should be able to put more effort in to getting to the top of the climb without any incident. I tried out the Windows Mobile Cycle Computer App last night and it’s very good. It displays the sats of avg speed, max speed, and elevation differences along with a real time map plot. (You can also display existing routes and follow them as per most GPS apps). Last nights ride – 7.8 miles 11.2mph avg 28mpg max 40 minutes ride time.